In my 7th UCI World Cup in Bilbao, Spain, I finally made it onto the Podium-twice! Bilbao has always been one of my favorite places to race due to the excellent organization by the Fundazioa Saiatu Foundacion, who have amazing volunteers doing transport, catering and race marshaling, therefore making an unsupported self-funded trip there easy for me. I also love the people of the Basque Country-open, amazingly friendly and always helpful. 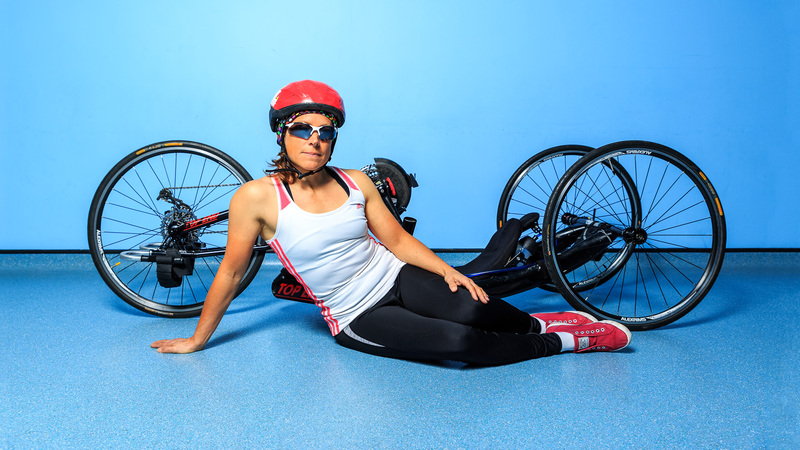 I was hopeful that the Rio Paralympics would have plenty of opportunities for my para-cycling hand cyclist friends, and would be televised. I was shocked to read results from just one combined road race medal event for FOUR very different categories, totaling 15 riders, whereas the six H5 women-there are only seven on the UCI world ranking list-competed in an entirely separate road race (all were ring-fenced slots). There were also only two time trial medal events, H1-3 with factoring, H4/5 with none, which was totally unfair to higher categories. There was no female Team Relay Team medal event either. I learnt from Sarah Storey, our UCI Athlete Representative, that two medal events had to be dropped to accommodate the Trike event splitting to separate male/females races, as there are only 50 medal events shared between Track cycling and Road cycling. Unfortunately, hand cyclists cannot compete on the Track, so it is not possible to do the varied and numerous short medal events offered there. In my dreams, I’m doing a World Record attempt behind the Dernyman, sprinting the final 250m to a new Guinness World Record…but that’s the subject of another Blog post! Whilst 2105 has been a pretty successful sporting year for me as you can see from all the trophies and medals below, I owe a huge debt of gratitude to the many individuals, friends and supporters, sponsors and businesses, who have supported me on my journey in para-sport. Fogarty, Master Quilt and Pillow Makers, http://www.fogarty.co.uk/blog/fridays-news who provided ‘Viva’ the VW, fully customized to fit my hand bike, plus two dogs and camping gear for my two month trek around Europe this summer. I’m still getting used to seeing my name on the side of her and am looking forward to more adventures! Mammoth Mattress http://mammothmattress.co.uk/category/elite-athletes/ who kindly supplied a custom made memory foam mattress for ‘Viva’ to make sure I had adequate sleep recovery in-between my races. Alfred Bekker http://alfredbekker.com/product-range/hand-controls-for-disabled-drivers/# who converted the van with hand controls that allowed me to cruise along the Autobahns and motorways of Europe in comfort. KitBrix http://www.kitbrix.co.uk whose bags do a sterling job of keeping all my cycling stuff well organized in the confines of ‘Viva’. The Arctic One Foundation http://www.arctic1.co.uk who provided me with a small cash grant which paid for my EuroTunnel fare to Europe to compete this year. 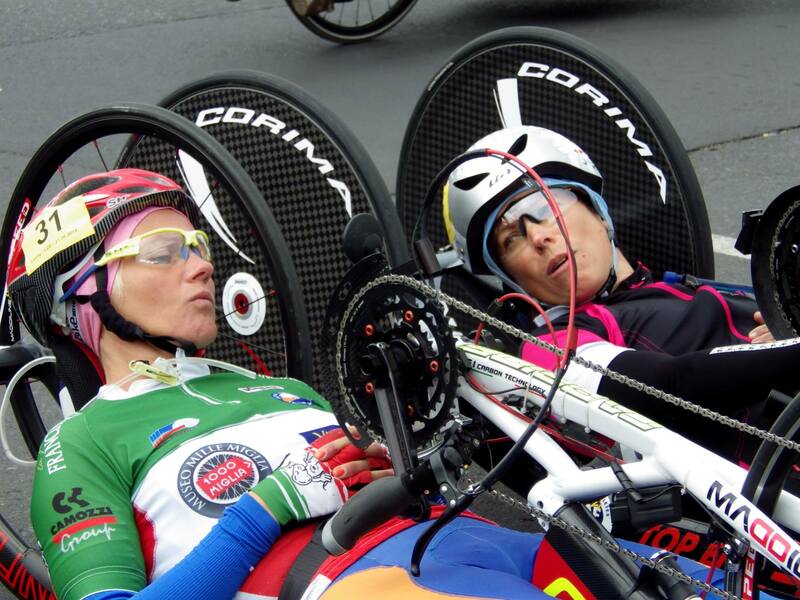 Challenged Athlete Foundation http://www.challengedathletes.org/site/c.4nJHJQPqEiKUE/b.6449023/k.BD6D/Home.htm whose training grant allowed me to pay for a cycling coach so I could train and prepare better. The University of Lincoln http://lincoln.ac.uk/home/media/universityoflincoln/schoolofsportandexercisescience/UoL-Sport-2015.pdf for providing Sports Science support-it’s been an interesting journey so far! My 5,000+ Twitter followers! The support, jokes, concern, sympathy, friendship and valuable contacts has been unending and I thank you. To all the people I met in Europe who helped me with dog-sitting, tent erecting, laundry, food, meals, campsites, shopping, doctors, friendship, swimming, directions, training and more! I can’t believe that Winter has arrived so quickly after a protracted mild Autumn. I am in semi-hibernation mode now, only venturing outdoors for long, cold, often wet and usually windy bike rides. I know that getting the Base miles in over the winter is crucial to success next season. Afterwards I retreat to my sofa and my laptop, filling in my training on Strava, my diet on MyFitnessPal and emailing my Coach. My race season this year started in sunny Abu Dhabi in March and ended in fascinating Beirut only two weeks ago! I trained in Portugal, Spain and Belgium, travelled to 10 different Countries and crashed badly in two races. 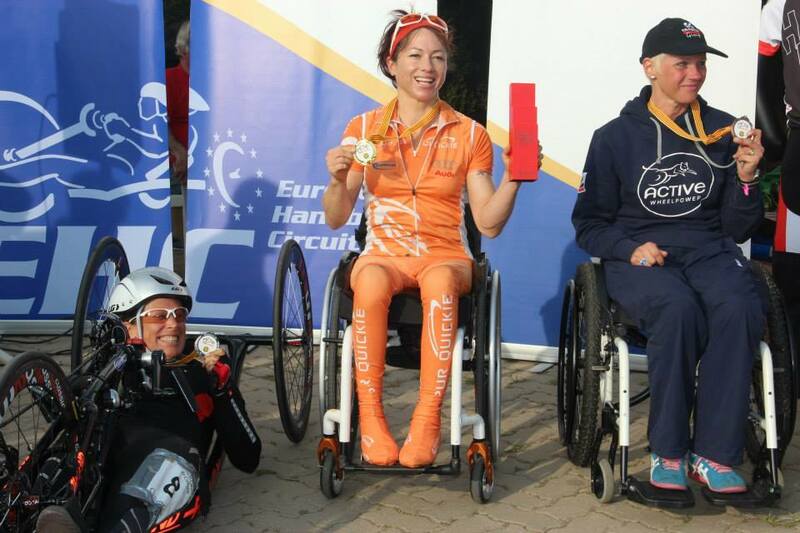 I won 7 Golds and 2 Silvers in the European Handcycle Circuit (EHC) to finally take the overall Champions jersey in the series. I competed in four UCI C1 competitions, winning six Gold and two Silvers. 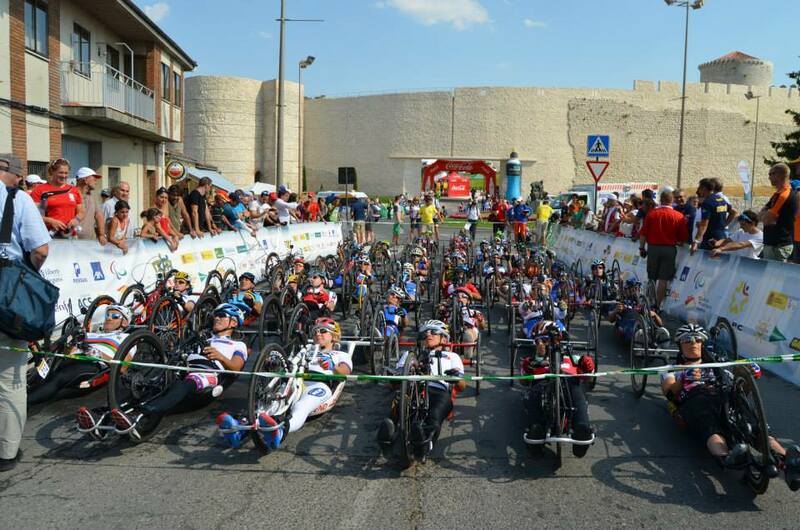 I raced as an Independent at two UCI Para-cycling World Cups in Italy and Switzerland, finishing 6th, 4th, 5th and 5th. My UCI world ranking is 7th in the world this year. I spent 10 weeks away from home driving solo over 10,000 miles across Europe and camping in a tent, then a van, accompanied by my two dogs Monty and Smudge. I was ‘living the dream’ according to friends, doing the Grand Tour I’d always dreamed about. In the middle of my travels, my best friend died suddenly. Thirty years of friendship-gone in an instant. Competing in para-cycling races just didn’t seem important anymore, nor did a world ranking, or even Blogging about my summer adventures. It would be two months before I’d enter another race. So, with a bit of perspective since the event and my best friend’s motto-‘Do what makes you happy’- ringing in my ears, I have two main aims for next year. One is to be selected for a place on the National Team and potentially compete in the Rio Paralympics. To achieve this, I need to train harder than I’ve ever trained before, as the selection criteria from my NGB is to be a consistent Gold medallist at World Cup level. The other is to raise enough sponsorship to to replace my three year old badly damaged race bike and enable me to travel to major competitions. Girls on the Podium in Barcelona! I have always wanted to visit Barcelona so an European Handcycle Circuit (EHC) race which was a P1 competition with the UCI, combined with a bit of sightseeing plus practice for my first UCI World Cup in May seemed a great idea. I would also gain points for my world ranking depending on my finishing position. 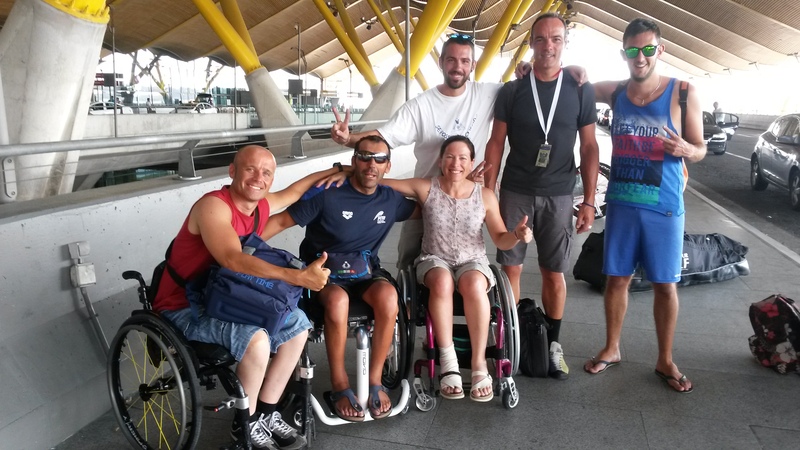 The Hotel, airport transfers, and a trip to the Formula 1 track for training were organised by Handbike Barcelona Club and two members also kindly accompanied me on two rides during my visit. The roads were busier than I was used to in Lincolnshire, so I was grateful to Martin for helping me train. The TT was held around the Olympic Rowing lake, which meant a headwind into the finishing straight but a bit of wind assist at the start. The University of Barcelona was doing some research and we lined up after registration the evening before for calliper tests with bicep measurements, The same tests were repeated straight after the TT and I was so occupied that I hadn’t realised I’d come second! The RR was held on the flat beach road the next day with a loop of about 4km with one technical turn and a roundabout. I made the mistake of assuming the race format was one hour plus a lap but it turned out to be the first rider past the post having done 38km. I was working with Romina from Italy sharing the drafting and sprinted when I heard the bell, only to do an entire lap at my best pace unnecessarily! I did, however, come second and was pleased with my race preparation for Italy in a few weeks time. People often wonder why I never have time to phone them back, email or text them but I am usually busy either out training, cooking proper food to fuel my training, looking after my dogs or travelling! Then of course, are events or meetings that I get asked to attend on a voluntary basis. This visit to the University of Lincoln for a photo shoot was in-between two back-to-back trips abroad for EHC Races. I’ve been in touch with the University of Lincoln Sports Science Department for some time now and they have recently agreed to sponsor me with support for the next year. That’s a huge bonus for someone not on a UK Sport Lottery funded program or supported by their NGB and the EIS as I am able to tap into a huge reservoir of sports science and knowledge for free. They are taking a huge interest in me and hand cycling and I will also be able to speak to engineers about various adaptations and modifications I’d like to make to my bike for next season. The photo shoot came about because Dr. Willmott at the University had a friend doing a 52 portraits in 52 weeks project and asked if he knew of anyone wanting free photographs done. I arrived back from the Czech Republic, put the bike back together and off I went to Lincoln the next day. I was a Graphic Designer working in London in my 20’s and am no stranger to photo shoots, although I was normally the person art directing it. We went through some shots David had thought about after I’d given him some input on where to find shots of hand cyclists on the web. My bike is nearly six-foot long, has reflective elements on it and lying in it does not always mean a flattering picture of oneself, or show the components of the bike and how low it is to the ground. Barely three days at home before I jetted off to the Czech Republic for another EHC Race, this time with the TT and RR on the same day. I arrived at 10:30 at night and put my bike back together as I had an early start to register for the races in the morning, with the TT scheduled for 10am. I love coming to Louny, a town outside Prague, as the countryside is beautiful and the roads are really, really good! I can confidently leave my race wheels on my bike for a training ride, knowing that my route will not involve pot holes, surface dressing or many cars. It’s a great advantage to know the course before you ride it, so I was well prepared for the fast downhill, but gruelling uphill for the TT. I felt fantastic and really strong and was over 3 minutes faster than third place. The RR unfortunately, had been changed to a tight and technical 4km sprint round the town, with a nasty 180 up a hill and round a cobbled roundabout. I drafted Romina for the first lap, but then dropped her when I went in front. She chased hard for the entire race, and was a mere 35 seconds behind at the finish. It was impossible to pick up any decent speed with constant braking for corners and the uphill section, so I was lucky to stay in front of her. Two second places were a great boost to my morale. I spent the next two days biking round the scenic hills and enjoying the company of Seine and his mum, regulars on the EHC scene.